The first tank offensive in history took place on 16 April 1917, in the first hours of the Battle of the Chemin des Dames. The Schneider CA1 tanks had to clear a path for the infantry. This initial grouping formed the 501st Special Artillery Regiment or RAS (Régiment d’artillerie spéciale) in May 1918. Its Renault FT tanks proved their effectiveness in Aisne and in Champagne by repelling Ludendorff’s attacks in spring 1918, then by leading a victorious counter-offensive. 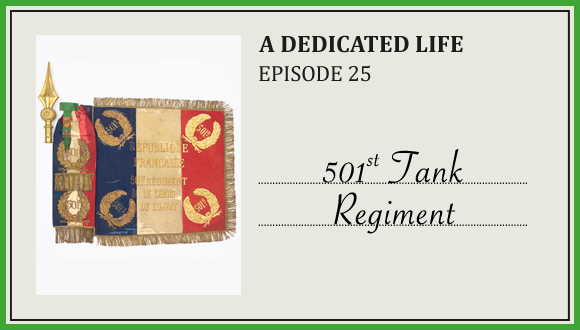 In 1920, the 501st RAS became the 501st Tank Regiment. The Free French Forces’ 1st independent company of tanks was created in July 1940. With two other companies, it resurrected the 501st RCC in May 1943. From the equatorial forest of Gabon to the Bavarian Alps, in Syria and Libya against Rommel’s Panzers, the regiment had a glorious career. Within the 2nd Armoured Division, it took part in the liberation of Paris and then, after crossing the Vosges and fighting hard in Alsace, rounded off the war by capturing Hitler’s Eagle’s Nest.